The NYSSPE recently held its annual Fall Conference in Saratoga Springs, New York. 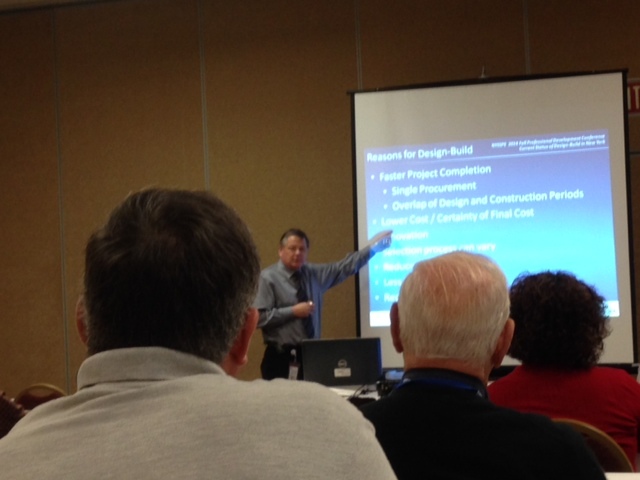 The conference consisted of several interesting sessions and speakers, however one topic that stood out was Design-Build in New York State. The NYSSPE also selected its slate of officers for 2015-2016 which will be announced in early December. Tim Conway, PE from the New York State Department of Transportation (DOT) presented a seminar entitled: The Current State of Design Build in New York State. Conway detailed the current state of Design Build in New York State and also compared design-build to the design-bid-build process. Most of the discussion focused around the relationship and roles between designer, owner and contractor. There was also a portion of the session dedicated to Design Build legislation in New York. Click here for NYSSPE’s March 2014 Position Statement on Design Build Budget Proposal. NYSSPE is currently making some minor modifications to this statement and working on an overall Design Build statement that will also cover Design Build in the private sector. The NYSSPE is currently working with other organizations including ACEC New York as well as others to create a combined approach to ensuring that future Design Build legislation is written in a way to hold the health and safety of the public in high regard.